This week, something with fond associations in my mind. Can it live up to my expectations? Let's find out. 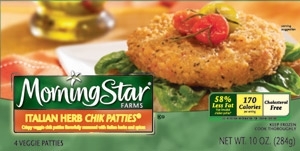 I'm going to test out Morningstar Italian Herb Chik Patties. Now, when I say fond associations, I have to go all the way back to living in the dorms at college. After the first, oh, couple weeks there, the exciting food choices weren't so exciting, and I settled into a routine of mostly breakfast cereal and chicken patties. Of course, hangover Sunday was greasy chicken nuggets and macaroni and cheese, but that's a whole other story. The chicken patties at my dining hall were delightfully reliable. Not spectacular, by any means, but I could count on them being tasty and available when other choices didn't seem too tasty. So I ate a lot of them, back in the day. I hoped that these could live up to my memory of my dorm years. I opted for the cooking option most likely to result in deliciousness - the oven. Yes, it takes a really long time, but when you want something with a crispy breaded exterior, there's really no other choice. After the designated time on the box, the patty was not quite hot enough, so I kept in in there a bit longer, until it was fully crispy. I ended up going about 7 minutes longer than the upper recommended time, but with chicken patties, the crunch is key. Finally it was ready to taste. First of all, it looked great, and it smelled great. I opted to just eat it plain, rather than on a bun, just to get the full effect. I was not disappointed. This patty had a nice herby flavor, as promised, and a mildly chicken-y flavor, which isn't too tough to do, since chicken doesn't have a terribly pronounced flavor to begin with. I was really pleased with this. I think this patty would be great on a bun, or on top of some spaghetti with some mozzarella cheese and marinara sauce, or on a Caesar salad. Or, like I had it, just plain on a plate, like the old days. This is one of my favorite options that Morning Star offers. On nights I forget to eat dinner, I pop on of these into the oven, and cook it while getting everything ready for the night. Most things i like on bread with cheese and some kind of greens. These I almost always eat plain. GMO death foods. Say not to GMO soy. Complain to morningstar farms on facebook to remove gmo from food or you will not buy it. It's death food.